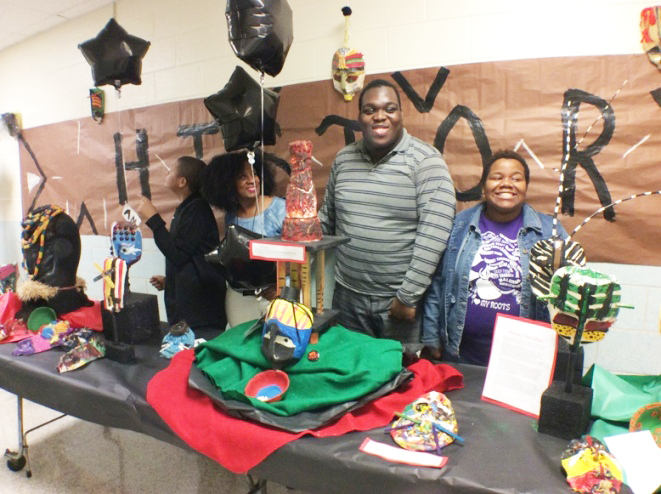 Students at Margaret Harris Comprehensive School are celebrating Black History Month by creating unique displays of African art. Margaret Harris students proudly display “Asha Xolani: The Guardian” which means life and peace in Swahili. 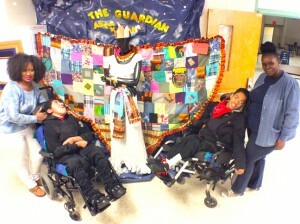 The Guardian’s wings were crafted from pieces of clothing donated by students at the school. Art instructor Latonya Robinson helped students to create and showcase their artwork for the school’s Black History Month celebration. The colorful African masks were created from clay and milk containers and were hand painted. All of artwork that was featured was made by students at Margaret Harris. Margaret Harris Comprehensive School serves students with severe and multiple disabilities between the ages of 3 – 21. Art instructor, Latonya Robinson, is using the project as a tool to help nonverbal and verbal students express their emotions and to encourage cognitive development. Teachers & students display “Asha Xolani: The Guardian” (Swahili for life & peace), with wings crafted from students’ clothing donations. 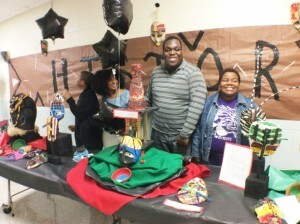 Students Vince Henry (L) & Saada Henry (R) showcase colorful, hand-painted African masks created from clay & milk containers.